FPT Telecom International is Vietnam’s leading telecommunications company. At FPT Telecom International, we strive to be a company guided by technological innovations, committed to the highest level of customer satisfaction, contributing to national prosperity and providing our employees with the most favorable work environment possible, enabling them to reach their full potential in their professional careers as well as their spiritual lives. Our highly qualified, internationally certified and experienced team of professionals is our fundamental capital. 100% of our technical specialists have at least one prestigious university degree, significant work experience in top-ranked tech companies such as Microsoft, Oracle, SUN, Cisco, Juniper, Sonic Wall, DELL, HP, and most valuable international IT certifications. We strive to provide our employees with many opportunities and rewarding experiences to grow and develop their careers. For system integration, we have been cooperating with big IT companies such as Cisco, Juniper, Dell, HP, IBM, Microsoft, VMware for many years. Together we regularly conduct employee trainings to encourage our team and help them to grow. We engage our employees to accumulate valuable experiences, and as a result, our specialists increase their qualifications and achieve the prestigious professional certifications such as Cisco CCNA, CCSP, CCNP, CCIE, VMWare VSP, VTSP, VCP, Juniper JNCIP, JNCIE , Microsoft MCITP, MCSA, MCSE, Linux +, McAfee, AWS CSA, ect. We believe that our success is the result of our teamwork, effective communication and designing solutions that can actually meet your complex business and personal needs. With more than 10 years of experience, FPT Telecom International is constantly looking towards the future and strives to enhance the way people and businesses communicate and collaborate in rapidly evolving digital era. 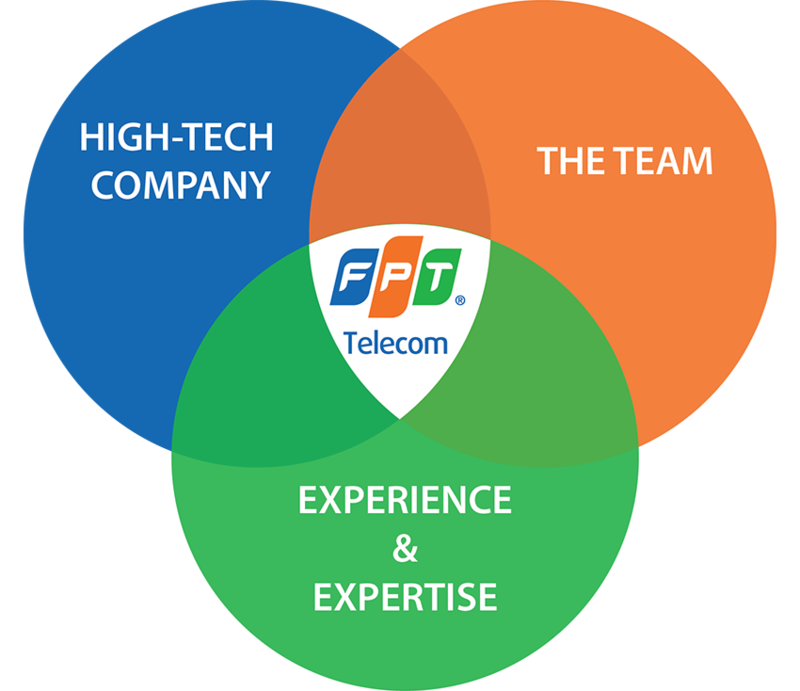 In FPT Telecom International, we work hard to expand our business and strengthen our brand name. We work closely with our partners, leveraging our scale in networks, customer reach and extensive operational experience to shape and lead the IT and telecommunications industry. 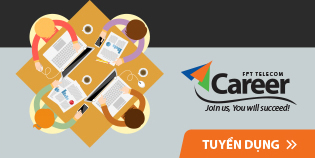 We keep up with the dynamic market and strategically launch new and improve our current products and services. We offer a comprehensive portfolio of tailored services together with our unlimited support to meet every need of your business. And as a result, we win our customers’ trust and loyalty in order to build strong relationships. In FPT Telecom International, we believe that a strong team of talents drives sustainable business success. Hence, we are constantly investing in attracting, retaining and motivating the top qualified IT and telecommunications experts. We are proud to have No. 1 experts in Vietnam, specializing in network technology, telecommunications and system administration, being a significant part of our team. And we are committed to provide them with competitive, performance-based pay and offering a large list of benefits. Internet/Data transmission connection services provider: IPLC, Internet Leased Line, MPLS, SD-WAN. Data Center services provider: server hosting and co-location, DC co-spacing, telehouse. Voice, SMS and Collaboration services provider: IP telephony, virtual IP PBX, SMS service, telepresence, voice and video conferencing. Cyber Security Services Provider: DDOS detection and protection service. Public Cloud services provider: FPT HI GIO CLOUD, Cloud Camera, Cloud storage, CDN. IT managed services: (remote and onsite outsources) network infrastructure and system monitoring, operating, IT helpdesk. Network, system and security solutions: service delivery in partnership with Cisco, Juniper, DELL, HP, Brocade, Sonic Wall, HP Tipping point, FireEye, Fortinet. Cloud solutions: private and hybrid cloud consultancy, solutions, design and deployment (Hyper-V, VMWare, OpenStack). IT integration services: IT consultancy, solutions, deployment and maintenance for enterprise customers. Cloud-based services provider, in partnership with: Microsoft as a Tier I Cloud Solution Provider (CSP) Tier I in Vietnam for Azure and Office365, Akamai NetAlliance Partnership for CDN/web-acceleration/DDOS protection products, Oracle Partnership programe (OPN) for OMC and cloud database products. Wi-Fi solutions: Partner with UniFi, Motorola, Cisco, Aruba, Nokia.